When you take into account all the sources of college aid that are available to students in this country, roughly nine percent comes from state governments. Recently that amounted to $9.2 billion. How states dispense this aid varies significantly. While nearly all states are strapped for cash, some are far more generous than others to college students. The requirements for who qualifies for the cash is also all over the board. Families with smart children are happy if they live in a state that doles out money based on merit. Often the teens who have higher grade point averages and test scores can win state grants regardless of whether they have the ability to pay for college. In contrast, families with low and moderate-incomes are more likely to benefit if they live in states where all or the majority of money is based on the financial need of the household. The Brookings Institute just released a report that explores the financial aid practices of all 50 states. You don’t have to read between the lines to appreciate that the researchers who worked on this report — and it relied on some real heavy hitters – aren’t happy with states that link the majority of their college grants to merit. Most of the states which reward affluent students through their aid policies – and stiff many lower-income kids – are primarily in the South. The worst offender is Georgia which dispenses all its college grants based on merit. I guess if you’re a poor kid in Georgia and you don’t meet the requirements for a state merit scholarship, good luck paying for college! In the chart below, you can see a bunch of interesting statistics. 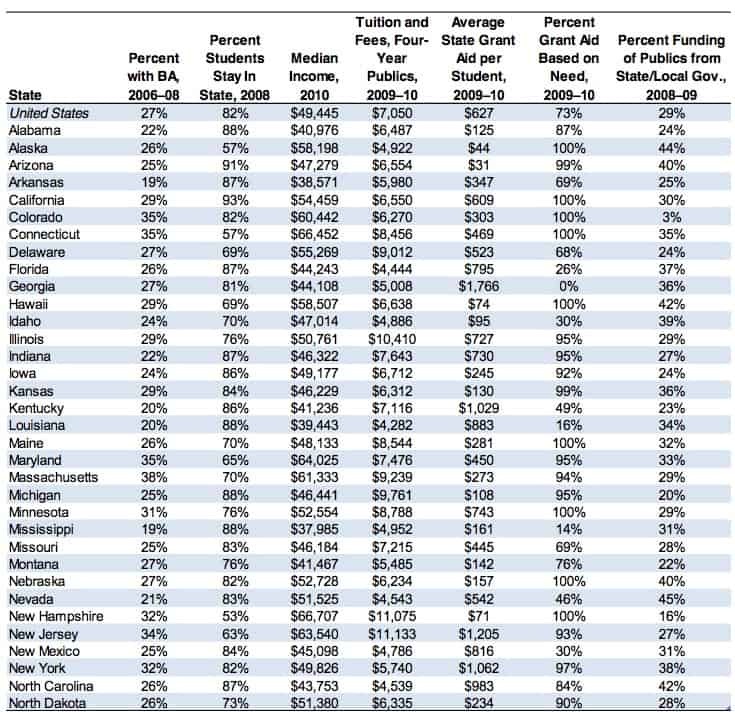 The left-hand column, for instance, shares what percentage of adults in each state have earned at least a bachelor’s degree. The next column indicates how many students attend college in their own state. California has the highest percentage of students who don’t cross state lines for college (93%), which I found that fascinating. In my talks around the state (I have one today in Costa Mesa), I will continue to urge California teenagers to look beyond their own state for great financial and academic fits. The average grant in some states such as Alaska, Arizona and New Hampshire is incredibly low. According to the report, New Hampshire and Michigan fall into the worst possibly category: high tuition/low financial aid states. 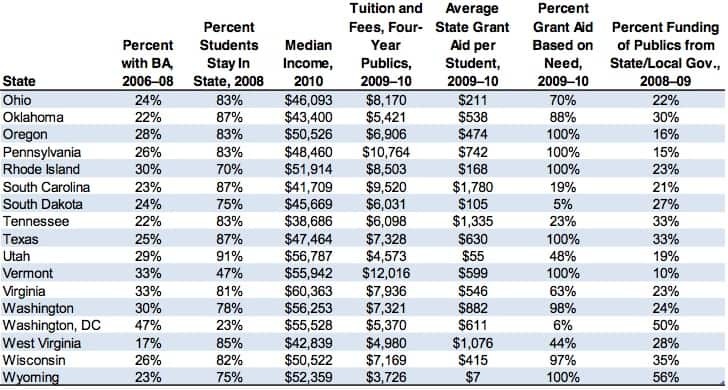 Alaska, as well as Utah, fall into the low tuition/low aid category. New Jersey and South Carolina fit into the high tuition and high aid category while West Virginia and Louisiana’s policies are characterized as low tuition/high aid. In the second and third column from the right, you can see what percentage of state aid is based on financial need and what the average grant is. I agree with the report that with limited resources, states should be directing their money to the students who actually need help to attend college. The report (Beyond Need and Merit: Strengthening State Grant Programs) recommended that states give their grants to students who have the most financial need and then link these grants to incentives to get the recipients to actually graduate. For instance, a student might be required to take a full class load of 15-credit-hours a semester to keep a grant. What is painfully clear is that the states aren’t doing enough to support their higher-education systems, which is making the cost of college more expensive for all students heading off to state universities. Lynn O’Shaughnessy is the author of the newly released second edition of The College Solution: A Guide for Everyone Looking for the Right School at the Right Price. I am looking forwards to hearing from you guy very soon. I totally agree with you Jackie! I would say the number one reason the kids stay in state and go to a UC is due to rankings. For many, the prestige factor is the most important selection criteria and many have not considered nor applied to other schools where they would get merit. In one magazine, UC Berkeley and UCLA are in the top 25. So the kids without financial aid find themselves with two options: pay full fare at the privates or pick a UC. There are many kids going to Berkeley and UCLA from my child’s school this year, and if you are not going there or something higher ranked, then you are looked down upon. Choosing any other UC is still seen as a better choice than going anywhere else. It is hard for a teenager to go against the majority in school. Just yesterday, my senior gave her reasons to her classmates for her college choice (less expensive with merit than UCLA, smaller classes & professors teach); however, that didn’t change their negative view of her choice. I think the ranking factor has so much influence on these young kids. Thank you Lynn for giving people another way to look at colleges. Also, I have to agree with the weather comment. I hear weather as a major decision factor and usually many have never lived in another state. Where my child is going next year, we are now hearing, “you know they have tornadoes there…” I guess that is what getting an education is all about, learning through new experiences, including weather. Alaska enacted a significant merit aid program that began with 2011 graduates. Students may qualify for one of three different funding levels based on their GPA, test scores and high school curriculum. Even so, many go out of state to school because our in-state choices are so limited and students often want to experience someplace different from Alaska. For those who leave, the discounts at schools in the WUE program are always a popular choice. Why more California students don’t avail themselves of that option is beyond me. Thanks for the info on Alaska! The average aid per student is confusing. Is that the total amount of aid over the total amount of students or just over the students who got aid? I find it hard to believe that students who qualify for aid in WY receive an average of $7, so my guess is it is the former. Also, it would be nice to know what percentage of students apply for aid and what percentage get it. I have also found in many conversations with parents of the college-bound that they just don’t get it: Because of the very low income requirements for state aid, paying in-state tuition for a UC will likely cost about the same as a highly ranked liberal arts college in the midwest .. even if your child is not a “star” student. Then why don’t California kids leave? I have heard many explanations — always beginning with the weather. But I don’t think that’s the deciding factor for most kids. With all the other advantages of LACs — graduation likely in 4 years, small classes taught by profs, sense of community — it’s hard to understand why more kids aren’t running to LACs. I suspect that if they were 20 years old vs. 17-18, LACs might look more appealing, and parents might be ready to let them go. Denise – I agree with you 100%. If California parents earn more than $80,000 in a four-person household, they will not qualify for any financial aid if they attend state universities. $80,000 is hardly rich — especially in this state — but that’s the cutoff for aid. After subtracting his merit scholarship, I am paying less for my son to attend Beloit College than I would at a University of California school. And he’s getting a fantastic education. I would never trade that for a UC education. I am puzzled why students limit themselves by insisting they can’t attend any school with cold weather. I also don’t understand why kids want to limit themselves to schools with big Div. I sports programs.